With the arrival of our first snow on Friday, I pulled out the last of our rutabagas. 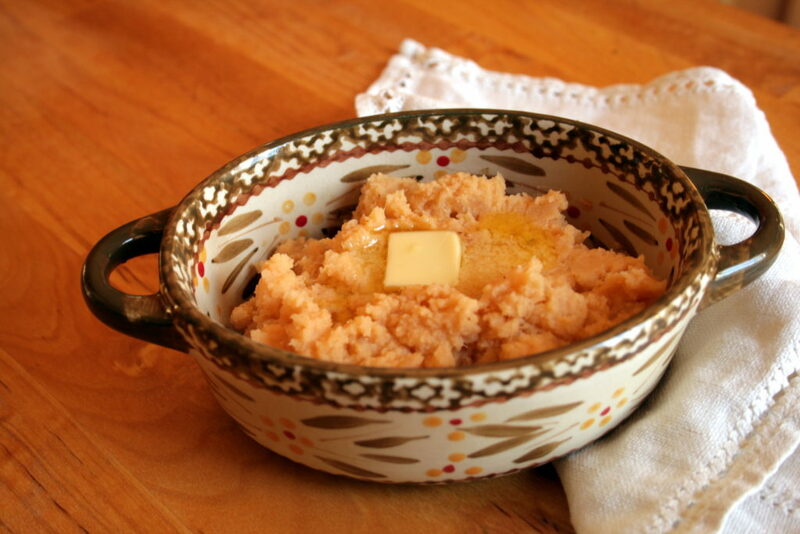 Since the familiar buttery, nutty, garlic goodness I often make with them is so dang delicious, we didn’t venture from serving it as such – mashed. In fact, this time of year I’m always trying to sneak extra garlic into our diet as we dive into cold and flu season, so this dish was perfect. As I relished the warm treat, it occurred to me that our Thanksgiving table could take an upgrade, swapping typical mashed potatoes for this nutrient and flavor-dense version. Maybe yours could too! 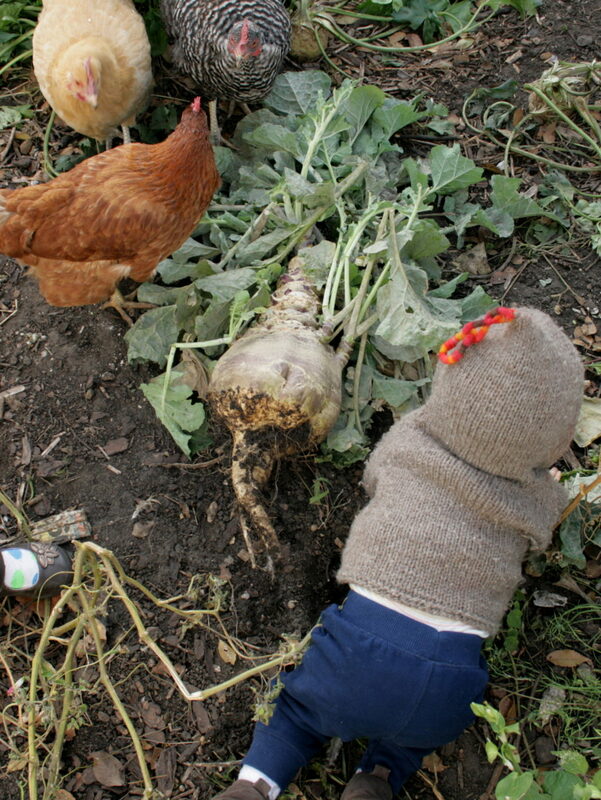 Ok, grab those roots from your root cellar, your grocery store or a nearby farmer. For the purposes of this recipe, I chose these three oddballs to equal seven pounds. Yes, I realize they do not look appetizing, but I promise there is golden, nutty flesh under that dimpled skin! Once I have the roots indoors, they get a good rinse in the sink. You don’t need to scour the dimples free of dirt as we will peel them. I have always peeled rutabaga, but I always grow large ones. If you end up with young and tender roots, I do not think it would be necessary to peel them, just as I don’t peel turnips. After rinsing, I hack off the woody taproot and the leaves. In my photo, you can see that I left a large part of the stem. Sometimes rutabagas stretch out this way and there is edible meat inside that stem part. The leaves are edible so I always set them aside so that I can de-stem, chop and vacuum seal them for storage in the freezer; a good supply for our many winter soups. 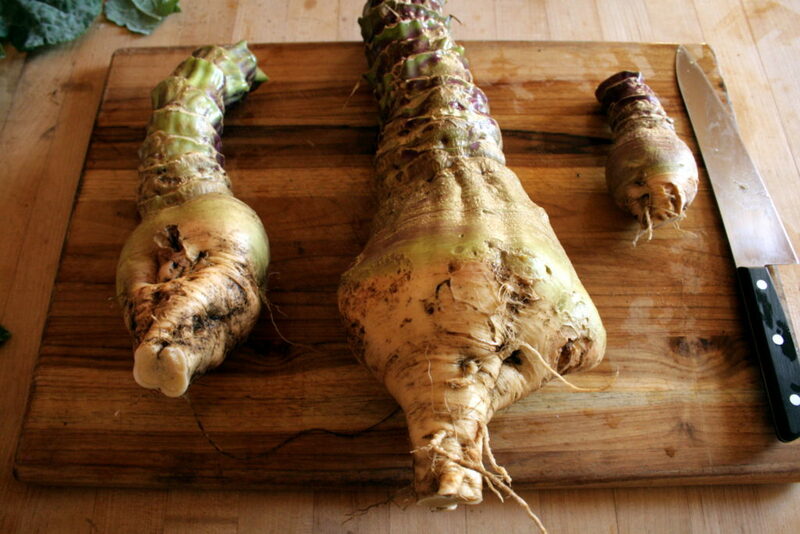 Next, take a knife, not a vegetable peeler, a good knife, and slice off the outer layer on the root and the stem. 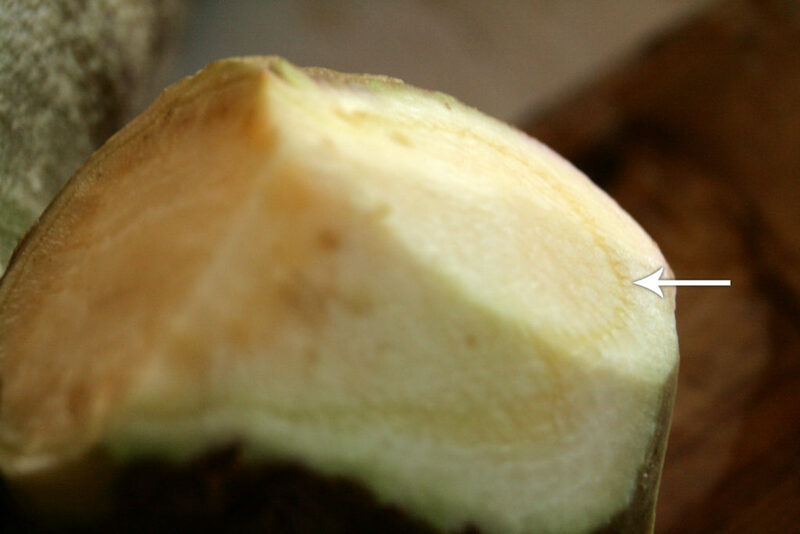 When you cut into the root, you should be able to distinguish the outer layer from the inner by the faint line appearing in the flesh (see arrow in photo). Slice off that entire outer layer; I use that line as a guide for how deep to peel. 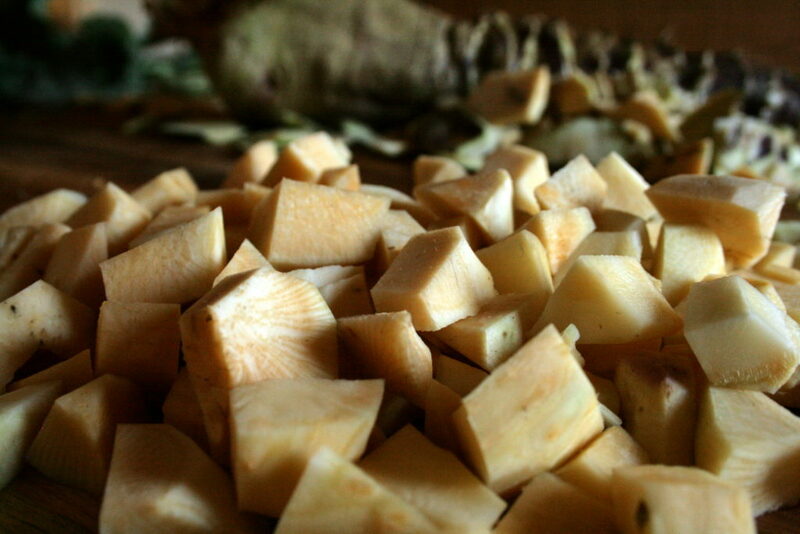 Once completely peeled, I chop the roots into rough 3/4 inch cubes. At this point, you can do what you like according to your recipe. Slice them in wedges or matchsticks, instead, for roasting in the oven. Slice them up thin for a gratin. For us, we will put these cubes into a pan and cover with water. 1 c. liquid: for best flavor, I use half cream + half broth or liquid from boiling the rutabaga. I have also used all whole milk, or a dairy-free combo such as coconut milk + broth. Prep and peel the rutabaga. Chop the root into rough 3/4 inch cubes. Put the cubes in a pan and completely cover with water. Bring the pot to a boil, turn down to a simmer and cook until the cubes are easily pierced with a fork. Strain the cubes from the cooking liquid. (You may wish to save this flavorful liquid for adding to the mashed roots, or a different stew.) 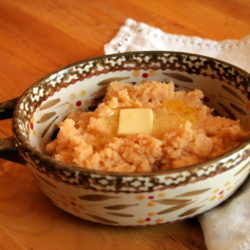 Put the rutabaga in a food processor, blender, or heavy duty mixer. Add the rest of the ingredients in. If you’re using a mixer, you will need to mince your garlic first. Where I use my Vitamix, I throw it in whole. Blend or pulse the mix to desired consistency. We go for a somewhat heavier consistency; not air-whipped on high.